Q: How did the panda lose his dinner? A: He was "Bamboozled". There's a lot more jokes where that came from. 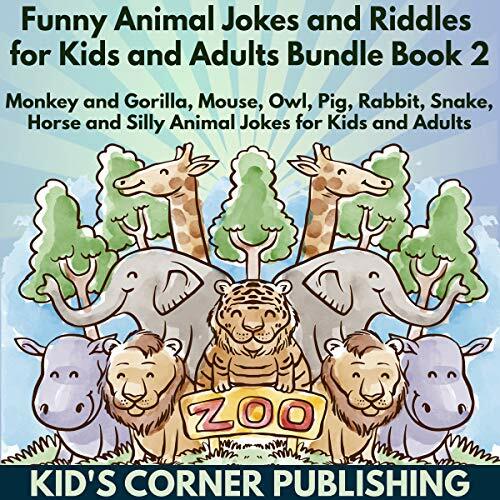 You won't regret getting this funny and silly animal jokes and riddles audiobook for kids and adults. There's also animal mini stories that will surely make your kids laugh out loud. It's a good audiobook to listen to and give as a gift for kids and adults. Everyone would enjoy a good joke. Please also visit my page for more jokes everyone will love. I got the first bundle, which my Kids liked so much. Now, this second bundle is another good addition to our jokes and riddles library. Good jokes to listen to on the car while on a trip. Awful jokes, 99% of them my kids did not even understand. This book has very few laugh out loud jokes and there is a lot of recycled material through out. Lots of Q& A jokes. Good for family fun day. Lots of question and answer jokes. Good for family fun day. We listened to it in the car while going on a 2 hour-trip. Had fun! Great use of different narrators. Funny! Bought it first before the first bundle. Kids really like these jokes. They find them hilarious. Narrators are good although at least one of the narrators talks really fast. Great use of different narrators. Kids aren't bored. I'd recommend the first bundle too. I got books with the same covers but they are of different bundles or joke books. Apart from that, this bundle is a good buy. It has 8 jokes book on it making it run to more than 3 hours of fun time with kids. Recommended! Too many funny Q and A jokes! Recommended! Too many funny Q and A jokes that would make kids think of silly answers while having fun. Works wonders for nana and the kids. No adult only jokes to be found. It is safe for kids to listen to.